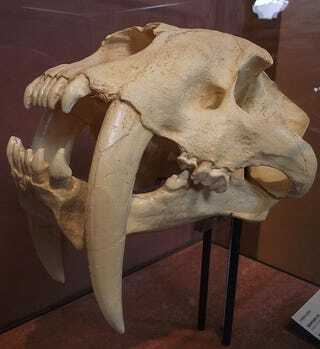 Sabertoothed cats weren't just modern cats with huge freaking teeth. They also had immense and muscular forelimbs. In fact, there were a number of other large-toothed carnivores beyond the smilodon, and new research by Julie Meachen, a paleontologist at the National Evolutionary Synthesis Center in Durham, NC, shows that they all might have had big, strong forelimbs too. Members of the Felidae, Nimravidae, and Barbourofelidae families at various points had evolved massively elongated teeth — which while looking incredibly metal, have a major problem with fragility. The small round teeth of modern cats are much better able to handle stress from all directions than the thin, oval cross-section of a sabertooth. In order to help mitigate the chance of fracturing their fangs, these predators evolved larger, more robust forelimbs to assist in their hunting. After all, your prey thrashes a lot less when held in place by massive claws. In a curious case of convergent evolution, across a number of different species the answer was always the same: the longer the teeth, the stronger the arms.